Why don’t we cycle in Singapore? Cycling is one of the most space efficient and sustainable mode of transportation in cities. Indeed, these pedal powered two-wheelers are faster than our own two feet, and can be as flexible as cars, without the emissions and noise. So why does cycling remain a less preferred mode of transport in Singapore? This is a common concern of potential cyclists in Singapore. Urban development patterns and morphology can hinder or facilitate active mobility. Indeed, a growing body of research provides evidence of a link between the built environment and active living (see also Ewing et al., 2003). Empirical evidence has shown that mixed use compact cities are more attractive for pedestrians and cyclists while low density mono-functional sprawls deter active mobility (see also Saelens, Sallis and Frank, 2003). It follows that in order to reduce our dependence on automobiles and move towards a car-lite future, dense mixed use urban development designed for human scale and walking speed is essential. Singapore has always aspired to follow a compact mixed use development model. This is evident in the various Concept Plan and Master plan statements (published by the Urban Redevelopment Authority) that propose a ‘decentralization strategy’ (Concept Plan 1991), to ‘bring jobs closer to homes’ (Concept Plan 2001), by ‘providing greater mobility with enhanced transport connectivity’ (). Even so, only 1% of the daily trips are on bicycles, compared to 22% in Amsterdam or the 14% in Tokyo. However, typical new town developments in Singapore are influenced by mid-20th century modernist planning principles like segregated zoning and traffic networks. There is very little to no mixed use developments, large distances between crossings, homogenous housing types, which are connected by wide high speed roads. These streets and neighborhoods appear to be designed for the convenience of cars, where being a cyclist is clearly uncomfortable (or unsafe). Despite Singapore’s well-intentioned efforts to become a cycle friendly city, the existing urban development patterns and street design do little to support these efforts. This mismatch is also one of the main raison d’être of our research project Engaging Active Mobility at the Singapore ETH Centre. Singapore’s geographic location close to the equator means a humid and hot climate all year round. Popular perception is that the weather is too harsh for cycling. But according to some, this is only a matter of expectation and conditioning. Most of our team cycles to work on a regular basis, as do a number of cyclists in cities around South East Asia that share the same weather concerns. The scientific workshop ‘Creating Healthy Places through Active Mobility’, initiated by the Centre for Liveable Cities in 2014 in Singapore, also arrived at the same conclusion. The international expert team asserted that tropical climate conditions are not a limiting factor for establishing a bike culture in Singapore. More than ever, technical and operational measures should be taken to ensure the connectivity and the continuous movement in order to reduce the physical effort. In addition, ancillary facilities like showers, lockers and changing rooms can be provided at workplaces for the convenience of cyclists. Even though owning a car in Singapore is restrictively expensive , motorized car traffic still enjoys a privileged status on Singapore streets. Traffic lane widths are generous, the roads straight and traffic signals are programmed to maximize car throughput while pedestrians must cope with waiting times beyond 90 seconds. In addition, most motorists do not seem inclined to share their space with cyclists. Hence, there are plenty of reasons for cyclists to shy away from roads and pedal along sidewalks instead. Frequent conflicts on the sidewalk with pedestrians and cars at garage entrances restrict continuous movement of cyclists who need to repeatedly break and accelerate, which can be particularly strenuous. While cycling on the sidewalk currently still illegal but remains largely unenforced, the government has recently accepted the recommendations of the Active Mobility Advisory Panel to legalise cycling on sidewalks and expects to put the new regulation in effect towards end of 2016. Given that the amount of people who are cycling in Singapore is very small, neither the car drivers, nor the pedestrians are really aware of the presence of the bicycles. As Figure 1 shows, pedestrians often encroach upon designated bike paths. Of course a behavioral change is called for, and there have been many efforts lately to institute this change. For example, the OCBC Cycle Singapore festival runs a ‘1.5 meters matter’ campaign encourages drivers to give cyclists more room. More recently, URA (Urban Redevelopment Authority) launched the monthly car-free day, to sensitize the general public to active mobility. LTA (Land Transport Authority) will launch an Active Mobility Campaign to increase awareness of the new policies, rules and codes of conduct. 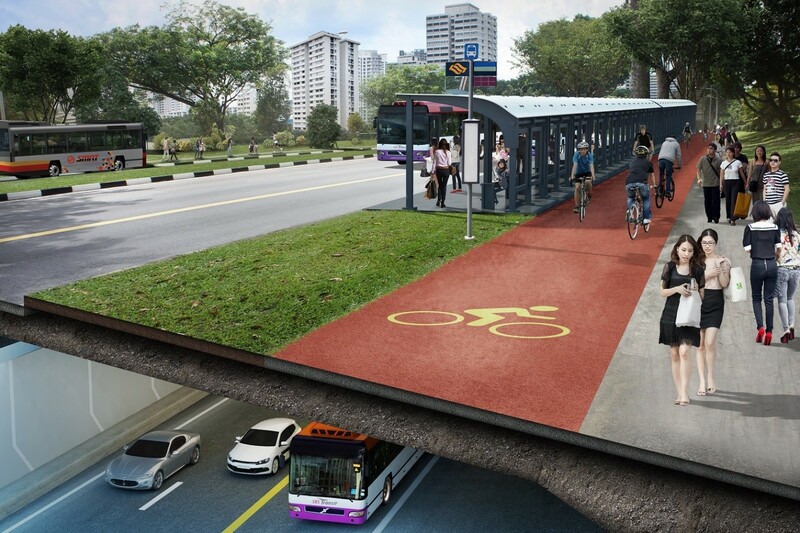 To surmount the shortcomings related to cycling on the road and on sidewalks, Singapore’s planners have so far put forward two types of design bicycle infrastructure: Park Connector Networks and Intra-town cycling. The Park Connector Network connects parks through a continuous network, exclusively for cyclists and pedestrians. The usage of this network is mainly limited to leisure activities. The paths follow a scenic, sometimes circuitous route instead of the most direct one, guiding people along rivers, parks and residential areas. Shelters are provided frequently for weather protection (see Figure 2). Even though cycling on Park Connectors is a pleasant way to discover Singapore, it is not suited to commuters needs. On a sunny day, the detours and recurring interruptions as illustrated in Figure 3, can take a toll on the rider. A second type of cycle network – intra-town cycling in specific neighborhoods with social housing (HDB) – focus on short distance trips to reach popular destinations such as subway stations, schools or shopping centers. The Land Transport Authority of Singapore selected 7 HDB Towns to improve cycling infrastructure by the end of 2015. Recently, a bicycle network was constructed in Pasir Ris, mostly consisting of bike lanes that are well segregated with directional signage and contrasting paving material (see Figure 4). However, by putting the bike lanes between the footpath and adjacent buildings, any building entrance becomes an area of conflicts with pedestrians and hence only allows cycling at low speeds (Figure 5). In addition, bicycles do not have priority at any time, as prescribed in the cycling rules, causing many speed interruptions (Figure 6). At some places, a sign asks to the cyclists to dismount and push the bike through the conflict area. Bicycle lanes sometimes end abruptly near obstacles like overhead bridges and lack of priority on intersections impedes a continuous cycling flow (Figure 7). Reduced speeds and added discomfort makes cycling a less than ideal transportation option on these networks. Another popular way to expand the bicycle network in Singapore is widening sidewalks, for example the new infrastructure in Tampines (Figure 8). However, this design with mixed zones also evokes frequent interactions between pedestrians and cyclists. But interestingly, according to our observations cyclists and pedestrians self-sort to a certain degree as cyclists chose often to pedal towards the side of the road. An important support infrastructure for cycling is parking facilities at destination. Due to the efforts of the city authorities and the transport companies, the capacity of parking amenities close to train station has augmented considerably over the last years. Nowadays, bicycle parking, sometimes covered as shown in Figure 9, are available on most train stations. However, given that flat tires are frequently observed, a fair share of the parked bicycle is probably not very frequently used, but calls for better parking management solutions. 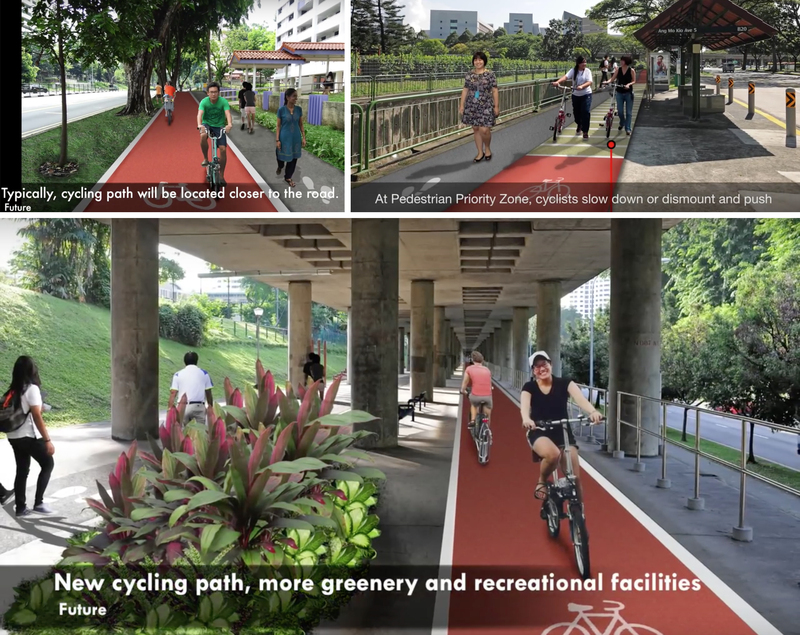 Even though public transport remains the main focus in the Land Transport Master Plan 2013 the Land Transport Authority of Singapore plans to expand the network of sheltered walkways and dedicated bicycle paths considerably by 2020. The efforts are directed at completing the Park Connector Network reaching a network length of over 700 km by 2030. The announcement of works to transform Ang Mo Kio in a new model walking and cycling town in December 2015 earmarks the start of a new generation of intra-town cycling infrastructure and serves as a pilot for similar schemes for all public housing (HDB) neighbourhoods. The renderings show that the cycling paths adjacent to the sidewalk closer to the road, which will reduce the number of potential conflicts with pedestrians. Near bus stops, ‘Pedestrian Priority Zones’ are proposed where cyclists are expected to slow down or dismount and push. On road cycle lanes are only planned along minor roads which means that cyclists are expected to share pedestrian crossings to turn or change lanes. While they are allowed to cycle across mid-block crossings, they are required to dismount and push at junctions which hinders continuous movement. However, a new segregated cycling highway cutting along (and below) an existing MRT corridor will allow continuous and sheltered cycling to the MRT station. For longer-distance connectivity, the planned North-South Expressway will be reconfigured to be part of a “North-South Corridor” that will include express bus lanes and a cycling trunk route to the city (Figure 7). Again, the cycling lane is planned adjacent to the sidewalk towards the road which generally lowers the number of conflicts with pedestrians but requires well thought out design solutions around bus stops. While the growing interest in cycling and walking, and the commitment of planning authorities to providing support infrastructures in Singapore are promising, there are several open questions that remain unanswered, opening interesting avenues for research. Cycling city role models such as Copenhagen, Amsterdam or more recently also New York and London are very different from Singapore with regard to the urban fabric and climatic conditions. The hierarchical street network restricts connections between neighbourhoods along low-traffic roads. At the same time, the main arterials are usually characterised by several rather wide lanes inviting motorists to speed well above the allowed 60km/h. Frequent bus services and stops cause additional challenges to fit in appropriate cycling infrastructure. Park Connectors seem ideal to overcome those challenges. Once the network gaps are closed, the segregated bicycle paths ensure stress-free and continuous movement through pleasant environments. Unfortunately, the origin or destination of a utilitarian (not leisure) cycling trips seldom is located directly along a Park Connector but usually within a town. This raises the question how existing roads can and should be redesigned to address cyclists’ concerns of perception of safety and continuous movement. In particular, previous and ongoing initiatives to improve the cycling infrastructure clearly struggle with the question whether and when cyclists should belong to pedestrian or vehicular realm. Based on the experience in other cities, it is clear that the propensity to cycle is directly related to how well the infrastructure caters to a cyclist need for safe, direct and comfortable routes. When designing such infrastructure, planners face recurring dilemmas and trade-offs. A cycling route along a major road might serve directness, but designing it to be safe and support continuous movement can be very challenging as potential conflicts with buses, cars and pedestrians must be considered. To meaningfully do so, we must understand how people perceive and react to different design options. Similarly, when designing a network of cycling routes, key planning questions are also where to invest and how much. Cycling demand not only directly depends on the quality of the infrastructure, but potential flows are also contingent on land use and the distribution of origins and destinations. In addition, how far people are willing to cycling is dependent on the required physical effort which again is dependent on the type of cycling infrastructure, climatic conditions and bicycle technology. Integrating all those factors in a consistent planning framework makes cycling network design can be a daunting challenge. Our research project, launched in February 2016, aims at answering these questions and challenges. By employing Virtual Reality applications in surveys we attempt to distill behavioral evidence that can guide planners through these dilemmas when designing future cycling infrastructure. By providing new spatial analysis tools that integrate with existing transport demand models and also harness big data sources such as public transport smart card records, we aim at solving the puzzle of cycling network design and find out how cycling can become a viable commute option in Singapore. As we embark on this journey, we welcome very much your comments and suggestions to support an engaged discussion! hello, we are a group of students working on a project that focused on the increasing road accidents involving cyclists in Singapore. in your articles, there are a lot demonstration about how does having a good infrastructure will help to encourage more people to take up cycling and also keeping them safe. however, other than the infrastructure as the bycle path, what more reasons do you think are also important in keeping cyclists safe on road? Besides infrastructure, also cylcling education and fostering a cycliquette (cycling etiquette) are important in keeping cycling safe. But this also requires the involvement of motorists, pedestrians and people using personlised mobility devices as well. For example, it would be beneficial if driving tests also include test questions in the BTT and situations with cyclist in the practical driving test. In terms of education, we have big hopes in applying at some point also Virtual Reality to educate people how to react best in different situations (that also might be too dangerous to test in the real world). But until such technology is developed, the experience in other countries show that particularly the involvement of schools and the traffic police is crucial. In the Netherlands, student are even required to pass a practical cycling test before graduating to secondary school. Which other points do you consider important to make cycling safe in Singapore? my name is azraa from sudan and am doing my master degree at the same subject ,i want to thank you for sharing this information .moreover i want to ask u if i could contant with you to disscuse about this issu because its going to be more beneficial for me . Being a Singaporean who lived quite a while in Karlsruhe, and also tried cycling from Kallang nus to work few years ago, i think cycling or not is a mental issue. Drivers’ hostel behavior against non-car road users is hard to change unless they themselves(or their family) cycle. Personally, i think the govt shd promote cycling among schoolkids(many Sinagaporeans never learnt cycle or master the skill to be confident on the road). Next Next post: How to model pedestrians and cyclists interactions with out-of-the-box features of Vissim? A single trajectory is a tragedy, 1.2 million is Big Data. Downs Automotive on How to model pedestrians and cyclists interactions with out-of-the-box features of Vissim? Niklas on How to model pedestrians and cyclists interactions with out-of-the-box features of Vissim?